Beginners and spectators are welcome at our club at any time. If you are interested just get in touch, and come to see us. You can start at any time, but we also run two beginners courses every year, in the spring and the autumn. 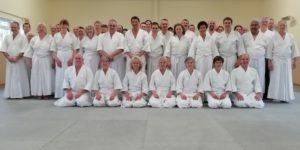 This is the only Aikido club in the Sussex area that is affiliated to the Ki Federation of Great Britain, which is led by Sensei K Williams (http://kifederationofgreatbritain.co.uk/sensei-williams/) who was a full time assistant under Kenshiro Abbe Sensei.